Displaying neutral beige & taupe shades, the fascia’s manufacture compliments home-yard settings showcasing an admirable wood panelled simulation. Factor sheds do not require varnishing, painting nor re-roofing, owing to the steel reinforced fascia panels constituting UV protected recyclable & durable polypropylene. Immune from rot, this type of resin endures snow, rain, sunshine & damp conditions without falling victim to decomposing. Refreshing appearances is swiftly completed by either a jet-shower down with the hosepipe or a light pressure-wash. Warm water including mild-detergent / white-vinegar & scrubbed with a soft brush aids to remove ingrained grime. Refrain from using abrasive cleaners to prevent scratching. Factor’s polypropylene apex roof structure ensures prompt drainage meantime resists decay therefore unlike roofing felt, never necessitates replacing. 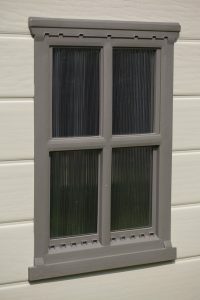 The squared-effect single window delivers natural daylight, this can be installed onto either side to suit garden locations meanwhile integrated ventilation grids distribute a throughput of fresh-air to overcome saturation. 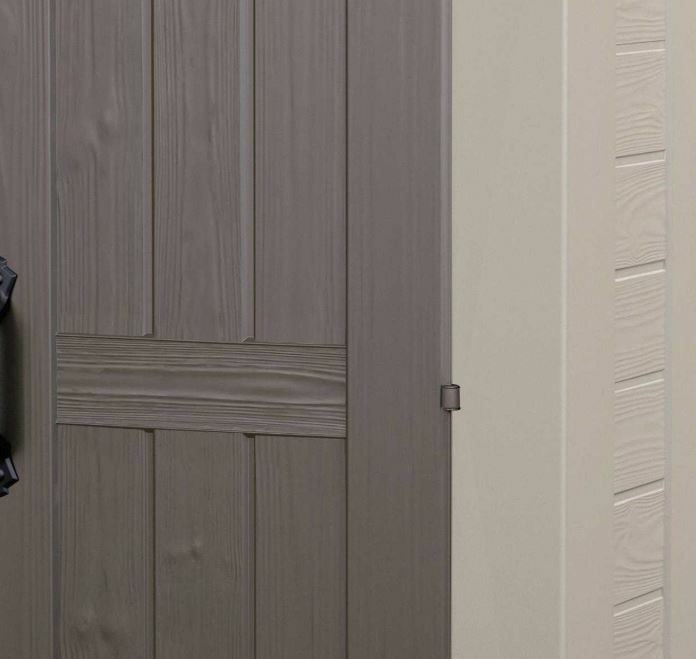 A secondary door panel next to the main door increases access when opened meanwhile the door can be installed to open either way. 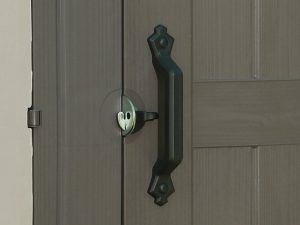 Factor door latches contain a padlock clasp to enable locking the storehouse. 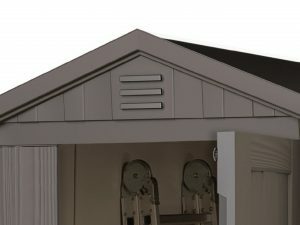 The fascia incorporates shelf supports for fitting up to 3 wooden shelves across the back of the shed, each is able to accommodate 20 kg / 44 lbs of storage. Shelf dimensions are presented within the instructions, thick plywood will make ideal shelving. 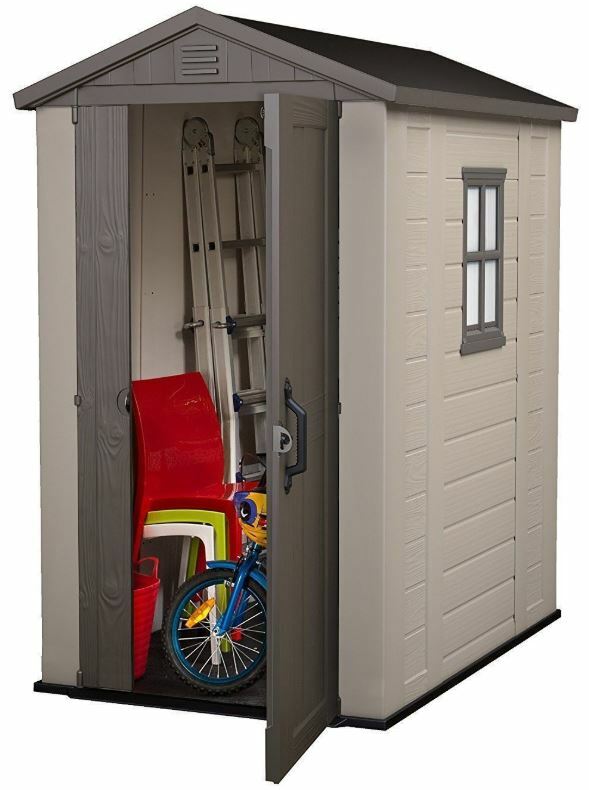 Alternatively, many resin-shed owners self-assemble those free-standing styles found in local DIY stores. 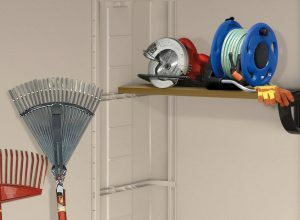 Inspect the internal and external measurements to check whether these dimensions accommodate your storage & outside location. Factor sheds intentionally cut back on some of their competitors’ superior features in order to deliver fair value for money. Combine the good set of feedback, inexpensive price, attractive display and maintenance boasting no more than a wash, there’s no surprise they’re a global best-seller. Thanks for checking out Factor’s 4 x 6 ft shed. 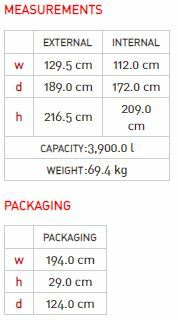 Wonderful i like the fact you can comparison shop the different sizes and styles.i downloaded the assembly instructions right from your site..no need to do a search through google..very through. Hi Cathy, thanks for stopping by to investigate Factor’s narrow garden shed. I always provide a download link to the instructions if available for convenience really. Helping visitors this way, as you mention, saves searching the manufacturer’s site and the web for the manual. A few manufacturers produce an installation video too, I always embed these as they provide a true insight into what’s involved. This 4 x 6 footer, on the other hand, is straightforwardly assembled with 2 people using household tools. 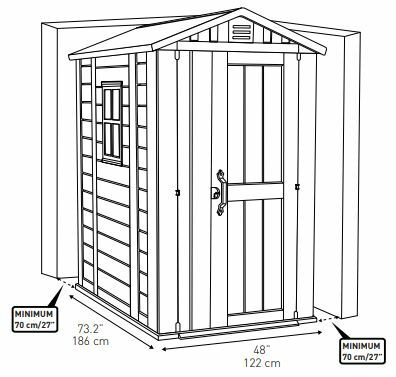 There are dozens of low-maintenance sheds available Cathy, varying from the smallest footprint up to very spacious sheds, including different shapes like this narrow shed. 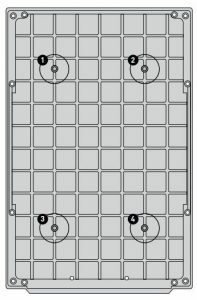 The Shed Sizes page displays competing sheds in order of size. 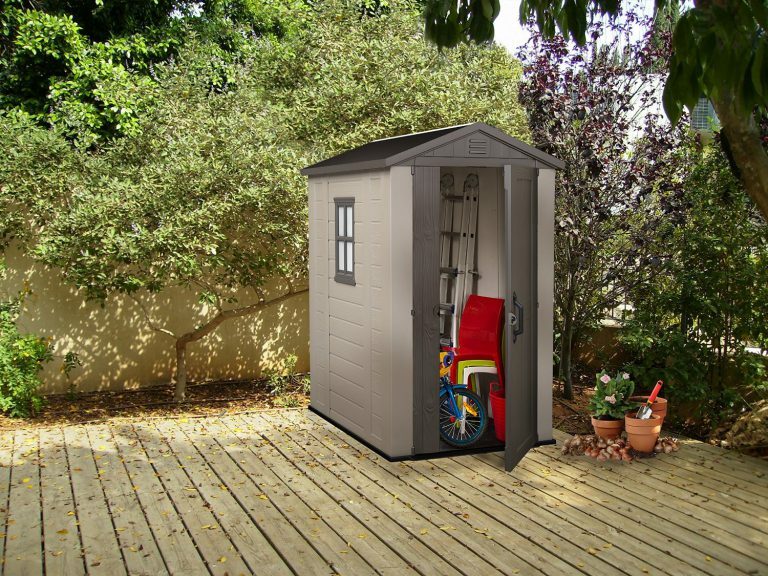 Wow amazing review of the keter factor shed! Very informative, and detailed. I appreciate you listing out the possible issue to consider. 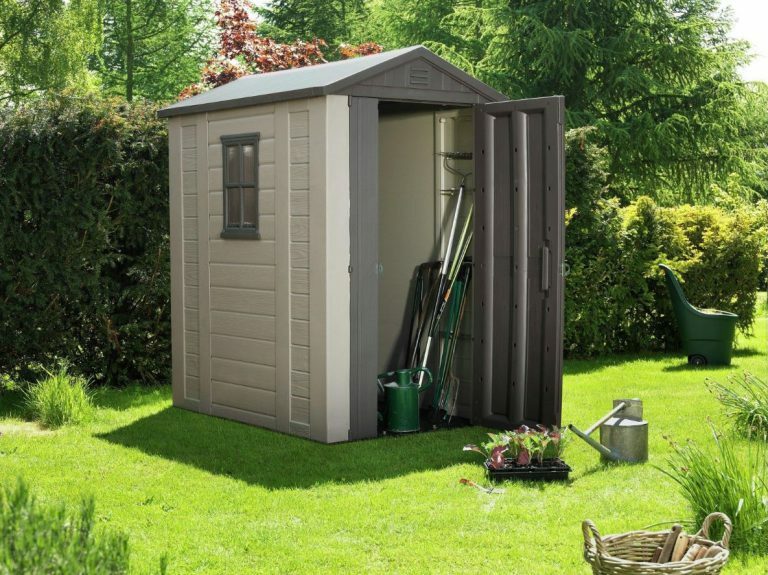 I been looking for a cost effective, and more importantly a space efficient shed. This one is definitely in my tops to consider! 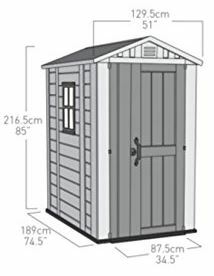 Hey Jordan, thanks for checking out Factor’s 4 x 6 ft low-maintenance garden shed. The Issues to Consider concentrate mainly on the foundation rules. Stationing the shed on a solid levelled flat base is critical preparation to undertake to ensure the floor subsists heavy duty storage stresses and the build constructs perpendicular in order to escape leaning stresses plus you’ll find aligning the panels so much easier during assembly. I usually mention not to accept anything damaged, ask the seller or Keter for an immediate replacement, trying to rectify damaged plastic never works. This doesn’t seem to be much of an issue in the UK, however, it is more common in America. The reason Factor sheds have accomplished global sales is because of their fair value for money. Okay, they do cut back on many of the quality finishing touches competing sheds incorporate, however, this would demand a heftier price tag. 4 ft wide by 6 feet deep fits in narrow locations, reasons for their popularity. 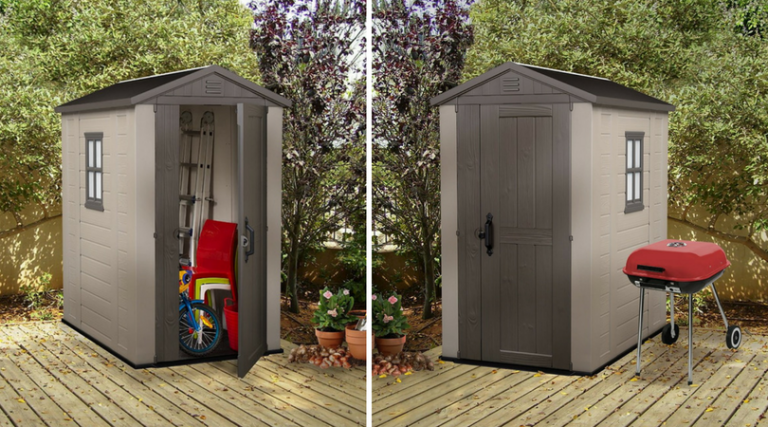 Great post about the Keter Factor shed. I love these types of builds. Solid, portable, and compact. Thanks for the review, this clears a lot up! Hey Jacob, thanks for calling in to read about Factor’s 4 x 6 footer. Like many people, we previously had the wooden variety which was okay for the first few years, after which the rot set in and subsequently demised into a rickety sad looking hut. Over the years we must have rebuilt the shed with the amount of decaying panels we replaced meanwhile being subject to annual re-varnishing duties and the odd roofing felt replacement caused us to look around for something that escaped these frustrations. Resin sheds suchlike these, sidestep conservation duties, their mere maintenance concerns a sporadic wash when grimy. We typically spray our shed down with the shower adapter clicked into the hosepipe, turn the nozzle to jet-wash and the fascia is refreshed in minutes, great news for us. Very thorough review you have covered all of it’s features and sizes. 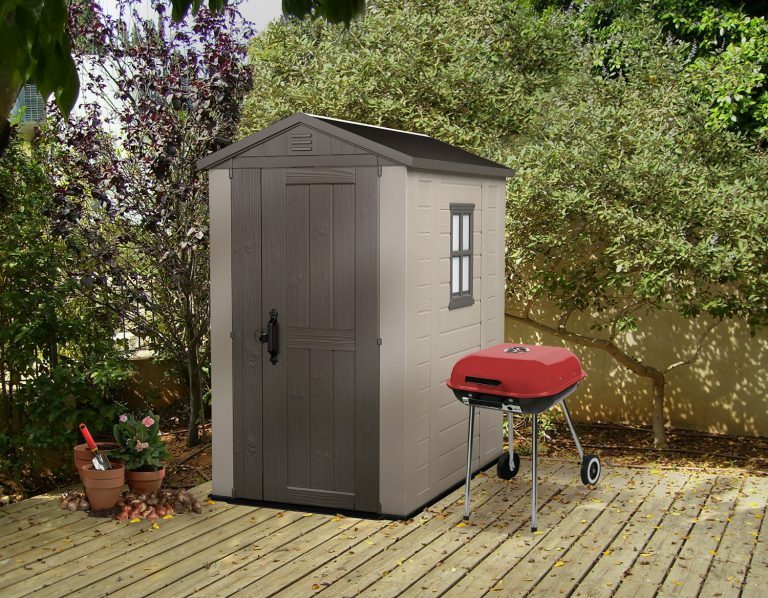 This looks like a nice sturdy shed and isn’t as ugly as some of the others. Hi Helen, thanks for dropping by to check out Factor’s 4 x 6 ft shed. 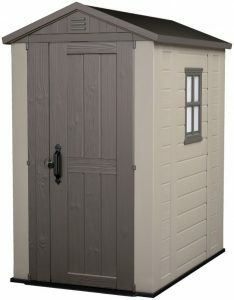 There are more stylish sheds on the market, courtesy of showcasing the likes of slate-tiled effect roofs, realistic wooden doors and stainless steel locking systems, etc, however, nothing competes with Factor’s prices, this range cuts back on some of the competitions sparkly features in order to remain extremely competitive, and they do deliver, hence their popularity & global sales. 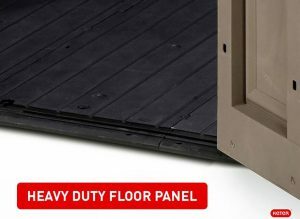 Factor’s lightweight panels construct into sturdy robust units whilst their moulding procedure simulates admirable wood panelling without the glossy look, meanwhile, apart from an occasional wash, they’re maintenance-free. I know Factor sheds are available in Australia, a visitor thanked me a few weeks back with regards to advice concerning preparing the correct foundations which have to be solid & level. He said the whole range is available in Australia but this website only points visitors towards the most competitive UK & USA prices. A quick ‘Keter Factor Shed’ Google search in your area should come up with results.